I feel like I’m having a bit of an identity crisis. 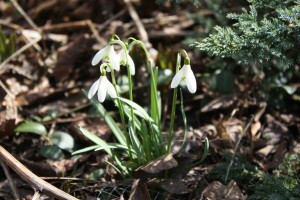 I’m eager to get into my garden as I see the first signs of Spring have sprung in the form of crocuses and snowdrops. But I’m a cautious optimist. Unlike friends and neighbours who have already raked up the remnants of Fall’s leaves and collected dead branches and dried up plant stalks in anticipation of the Spring bloom, I’m waiting to see if Old Man Winter has really left the building. While I’d like to be out in the garden getting everything “ready,” there’s a voice playing in my head saying, “ready for what? Have you read the long range forecast lately?” And so I continue to exercise restraint, choosing instead to pay my respects to the last vestiges of winter by baking the ultimate comfort dessert, super chocolatey brownies and throwing together a pot of purÃ©ed chestnut soup. I attempted a new brownie recipe this weekend from a book given to me by my brother and sister-in-law. 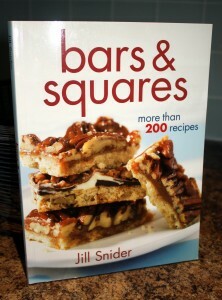 It’s simply called “Bars & Squares” by Jill Snider. I’ve casually flipped through the book and thought about attempting a few of the recipes. I thought there were only a couple of brownie recipes in the book when I first started assembling my ingredients. Well, had I been paying closer attention I would have noticed the book has an entire section devoted to the brownie. In my haste I began putting the ingredients together for the “Brownie Overload” recipe, which calls for an astounding 2 1/2 cups of coarsely chopped bittersweet chocolate. Then I notice the recipe calls for nuts and dried cranberries. Yuch! That’s not a brownie! So I start flipping pages only to discover I have 23 brownie recipes to choose from. But I have to stay the course, because I’ve already measured and mixed my dry ingredients and chopped up most of my chocolate. So, about an hour later I end up with a 13 x 9 pan of ultra-rich brownies. I think I over baked them a bit much, but all I need to do is throw one into the microwave for 11 seconds and it is absolutely heavenly. 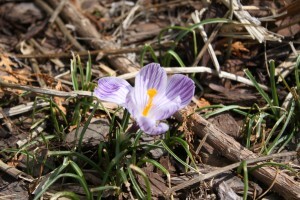 Perfect for an early Spring day to fight off a chilly breeze. 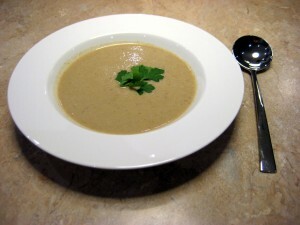 And finally, before the weekend concluded I promised myself I’d get around to making the chestnut soup recipe that my close colleague and friend, Susan Bishop was kind enough to share with me. 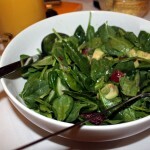 She gives credit to New York Times cooking columnist and author, Mark Bittman, for the recipe. And true to Susan’s words, this was a very easy recipe to make. The hardest part of this recipe was finding the main ingredient, because fresh chestnuts are out of season. So I decided to do like Susan and buy the package of roasted and peeled whole chestnuts. A simple enough task, no? No. Upon inquiring as to the whereabouts of said chestnuts, not a single grocery store clerk had any idea what I was talking about let alone where in the store I might find said chestnuts. 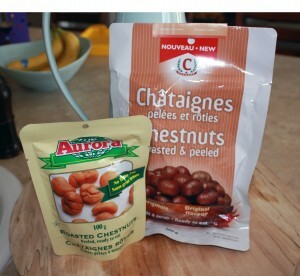 But I persevered and eventually after visiting grocery store #4, I found them in amongst the dried fruit and nuts. I was pleasantly surprised to see several brands available. In the end I opted for two different size packages because I wasn’t sure how many came in a package or how many I’d need. The recipe essentially involves sweating chopped onions and celery in olive oil with salt and pepper. Add 10 large chestnuts (I didn’t really measure this out) and cook in 4 cups of chicken broth for roughly 30 minutes. I let it cool and then threw it all in a blender. Susan says she likes to garnish the soup with shitake mushroom caps sliced and sautÃ©ed in butter until crisp, but I didn’t have any. And after the hunt for the elusive chestnuts I didn’t really want to venture back into the grocery store. As for the soup, it has a nice, light nutty sweet flavour and because it’s cooked in a chicken broth and there’s no cream added, it’s not a heavy soup. 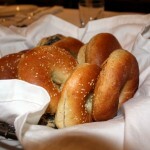 No doubt great as a starter or on it’s own with a good piece of fresh baguette for sopping it up. So there you have it. A weekend spent looking forward to the impending Spring with a nod to the passing winter, which no doubt will have its final day of reckoning before we can safely put away our boots, jackets, gloves and hats. 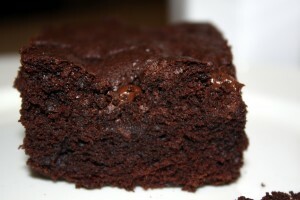 In the meantime I’ll be happy slurping my soup and nibbling brownies. There are no rules when it comes to brunch. The in-between nature of the gathering essentially gives me license to serve anything I want to my guests. The very melding of the words breakfast and lunch suggests the meal can and should be a combination of cold and hot dishes both heavy and light in nature. 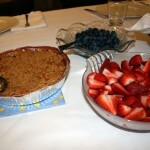 I love hosting brunch because it really allows me the freedom to get creative in the kitchen. I like to take my inspiration from Barefoot Contessa, Ina Garten. In the past I have hosted brunches, both elaborate and simple in menus, for birthdays and showers or just as an excuse to get family and friends together. 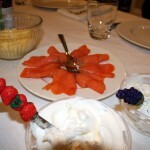 The latter was the reason for today’s brunch and the menu was relatively simple: fresh Gryfe’s bagels, cream cheese, lox, an assortment of hard cheeses, my favourite Beit Yitzak wild blueberry jam, spinach salad with cucumber, avocado and blood orange in a vinegrette, freshly baked peach raspberry crisp and fresh strawberries and blueberries. Our guests included Dave’s parents, his uncle Ted and Aunt Dru in for a visit from New Jersey, as well as my parents who decided to crash the party for a short time. Oh yes, and the kidlets. Who can forget the kidlets??? There will be many more brunches to write about in the future. And I do hope people share their favourite brunch menus with me. 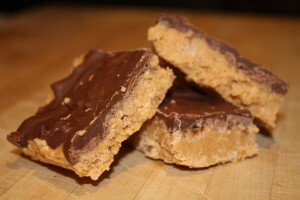 Melt 1 cup of peanut butter (must be like Skippy–not all natural) with a heaping cup of butterscotch chips. This takes time, as the chipits have a stabilizer in them that makes them finicky to melt. Melt a heaping cup of semi-sweet chocolate chips and spread evenly on top of peanut butterscotch mixture and refrigerate. After cooling completely, take it out of the fridge and allow to come up to close to room temperature and cut into squares (this will prevent the chocolate from shattering into jagged pieces).